When it comes to churros, there’s never a bad time for those sweet and cinnamony fried bits of goodness. We typically equate them with fairs and carnivals, but a stroke of genius had us reaching for our waffle iron to see if we could recreate them at home…. After some trial and error, we’re happy to share that our waffle-iron churros were a smashing success! They’re perfectly crispy, and the cinnamon-sugar mixture they’re coated in makes them taste exactly like the fairground treat we can never get enough of. It’s so nice to not have to worry about hot oil splashing around your kitchen – we can make these with our kids and then enjoy them all together! Turn on waffle iron, lightly grease with nonstick spray, and let heat up. First, prepare waffle batter: in a large bowl sift together flour, sugar, baking powder, salt and cinnamon. In a separate bowl combine warm milk, butter, eggs, and vanilla. Once combined, mix wet ingredients into dry ingredients, and stir until batter is smooth. Ladle approximately ¼ cup batter into each quadrant of iron; close and cook until golden, 5-10 minutes. Repeat with remaining batter. For the churro topping, mix together the sugar and cinnamon in shallow bowl or plate. For the dipping sauce, combine all ingredients in microwave-safe bowl, and microwave in 20-second intervals, stirring in between, until chocolate has melted. 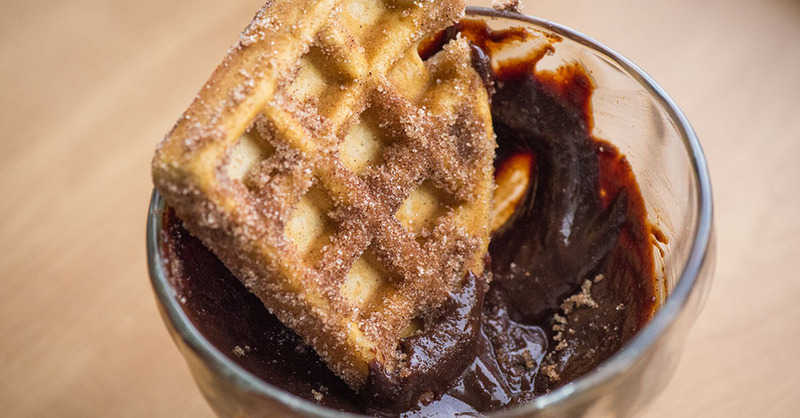 Once waffles are cooked through, remove them and drizzle or brush with melted butter, then dip in cinnamon sugar mix. Serve hot with dipping sauce and enjoy!